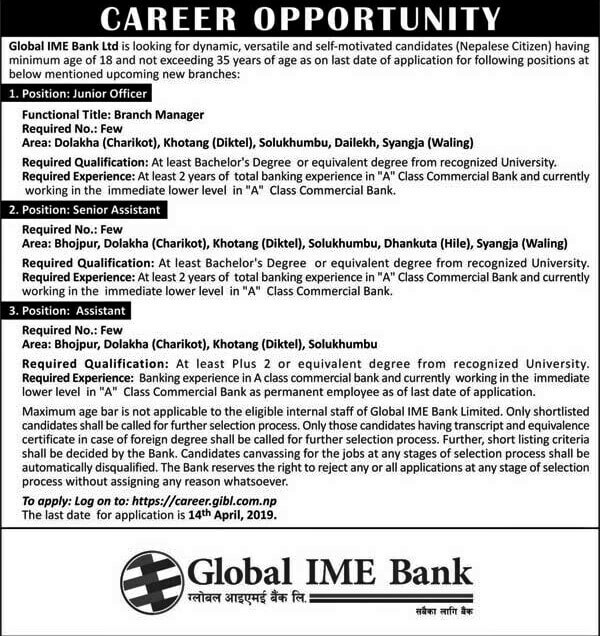 Home / Banking jobs / Vacancy / Career Opportunity at Global IME Bank Ltd.
Career Opportunity at Global IME Bank Ltd. Required Qualification: At least a Bachelor's Degree a or equivalent degree from recognized University. Required Experience: At least 2 years of total banking experience in "A" Class Commercial Bank and currently working in the immediately lower level in "A" Class Commercial Bank. Required Qualification: At least a Bachelor's Degree or equivalent degree from recognized University. Required Qualification: At least Plus 2 or equivalent degree from recognized University. Required Experience: Banking experience in "A" class commercial bank and currently working in the immediately lower level in "A" Class Commercial Bank as a permanent employee as of the last date of application. Application deadline: The last date for application is 14th April 2019.